Marc Levinson, executive director of MISBO, an association serving over 300 independent schools in the Southeastern United States, visited Jackson Academy December 11. He toured parts of campus and met students and faculty. He spoke to President Jernberg and the administrative team about national independent school trends in areas of financial sustainability, educational change, independent education value, and effective governance. He tours member schools and speaks frequently at independent school conferences as part of his role as executive director. Jackson Academy regularly hosts site visits by associations as well as independent and public schools to keep current on changes in education and share information that helps JA and other schools improve the delivery of education. 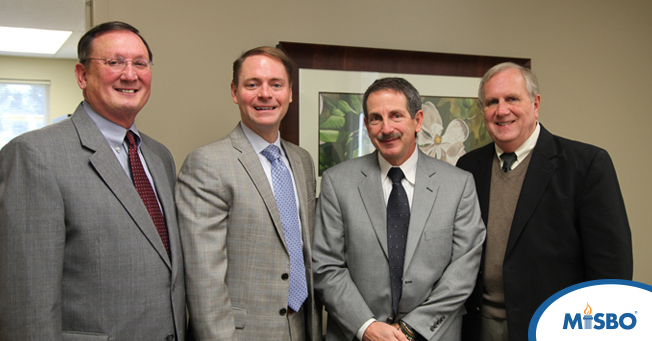 Mr. Levinson is shown with Pat Taylor, Cliff Kling, and Peter Jernberg. Mr. Kling serves on the MISBO Board of Directors.